It was another explosive year for Filipinos engaging in the sweet science. Here's a look back on the year that was. After back-to-back defeats in 2012 and a showcase fight in 2013, Manny Pacquiao finally returned to his finest form this year. 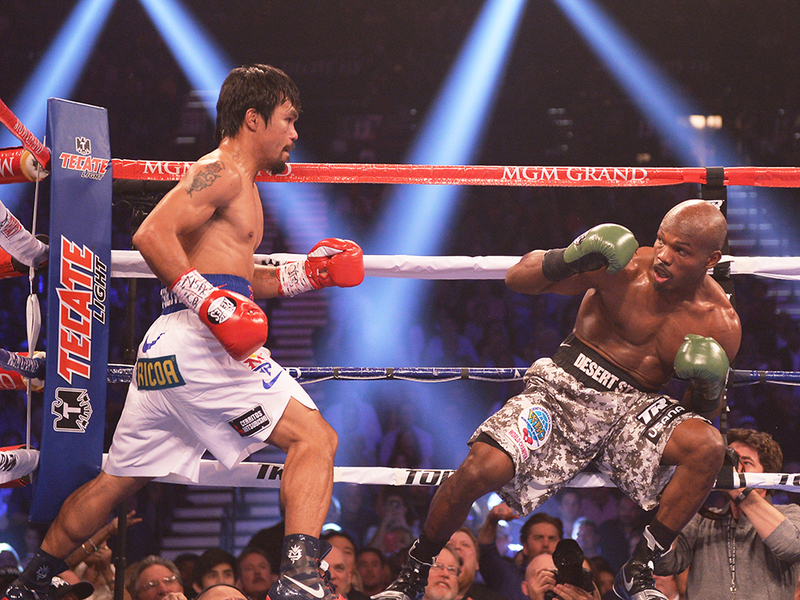 Pacquiao first defeated Timothy Bradley in their rematch last April. The second meeting between the two combatants was more competitive than the first; Bradley was game and mostly looked for a knockout in their 12-round contest. Pacquiao fought wisely, boxing his way in and out of Bradley's range by using timed and calculated attacks. Bradley had his moments by landing numerous right hands on Pacquiao's face. Both fighters made it to the final bell, but there was no controversy this time. In the end, Pacquiao's arms were raised as he rightfully won the rematch and regained the WBO world welterweight title by unanimous decision. Pacquiao fought previously-unbeaten Chris Algieri seven months later. The fight was a Pacquiao show from get-go, as the Filipino ring icong sent his man flying to the canvass six times en route to a lopsided unanimous decision victory. In 2014, Pacquiao proved that he still has plenty of gas left in the tank. By winning against two previously-unbeaten world champions this year, Pacquiao is a contender for the global fighter of the year recognition. The fight was held in the same venue where Manny Pacquiao used to pack audiences as a young boy who punched his opponents senseless: the Mandaluyong Gym. The event was promoted in July by retired two-division champion Gerry Peñalosa and was open to the public for free. Too bad for those who didn't make it to the venue, there was no live TV coverage for them to witness the exciting battle. Jason Canoy at that point had 13 knockouts in 19 wins while Giovanni Escaner is a known hard puncher himself, with 7 KOs in 11 wins before the bout. After a little boxing and a few jabs in the early going, both fighters decided to trade bombs in the center of the ring and on the ropes. It was Canoy's accurate right straight and left hook on top versus Escaner's right cross and haymaker. The fight soon became a war of attrition between the two young fighters. As the rounds passed by, it was quite visible that Canoy was taking the punishment better while Escaner started to fade. Jabs were close to forgotten and mostly power shots were thrown midway through the fight. An exhausted Escaner was looking to get a knockout using his right hand but was getting pummeled with straight rights and left hooks. The imminent finally took place in the eighth round. Canoy was pouring it on and finally decked Escaner after a series of hard combinations that saw the latter crashing to the canvass and almost out of the ring. Amazingly, Escaner stood up to beat the count, only to get punished up to the last second. Escaner and his team by then have seen enough, forcing them to waive the white flag before the start of round nine. Former world title challenger Akifumi Shimoda was the aggressor, controlling the first two rounds. For a moment, he seemed to have everything figured as he landed hard and clean shots on Marvin Sonsona. But former world champion Sonsona is not a punching bag, and he certainly wasn't in Macau to just collect a paycheck. As soon as an opening became available in round three, the southpaw Sonsona unleashed a thunderous left uppercut that was heard around the world. Shimoda was out even before he dropped to the canvass, making Filipino referee Danrex Tapdasan waive the fight after the count of two. An underdog and supposed to be a stay busy opponent, Rey Loreto was expected by scribes to get handily beaten by Nkosinathi Joyi when they fought in Monte Carlo this past February. The 13 defeats in Loreto's record hardly mattered when the fight started. Loreto didn't read the script, nor he had any respect for his seasoned opponent. After evading a right hand in round three, Loreto threw a looping left hand counter that landed clean as a whistle, dropping Joyi senseless to the canvass. The shocking upset earned Loreto the IBO world super flyweight title. The 22-year-old Davao del Norte native has always been a sound and technically gifted fighter. For years, the only checkmark missing from Ancajas' list of abilities was punching power. But that's not the case nowadays. After being taken under the guidance of Team Pacquiao's Nonoy Neri, Ancajas finally acquired the power he seemed to lack since making his professional boxing debut five years ago. Ancajas stepped up in competition and had a busy 2014, fighting twice each in Davao City and Macau. All four fights ended by stoppage and he earned the IBF Pan Pacific super flyweight title for his troubles. Ancajas is still learning, still improving. With youth and a great team backing him, this writer clearly sees a world beater, a world champion in the making in "Pretty Boy". After being banned by his mom from fighting at a young age, Jim Claude Manangquil had to resort to other means to get involved in the sport. He started to manage his own fighters at 13 and began promoting fights at 15. The Sanman Promotions boss was busy all year round, putting up local boxing promotions and managing his boxers' fight in various countries. In August, Manangquil had his first world champion when Randy Petalcorin stopped Walter Tello in China to win the interim WBA world light flyweight title. Last September, Manangquil promoted General Santos' biggest boxing event to date that featured fighters from different parts of the globe. He also guided Daryl Basadre to the WBC youth world bantamweight title last month in Japan. To end the year on a bright note, Raymond Tabugon won the IBO inter-continental light flyweight title in South Africa this past December 12. Manangquil says that one day, he will live his boyhood dream to lace them up and turn professional. It remains to be seen if he will be as successful boxer as he is as a promoter. As it stands, Sanman Promotions is turning out to be the country's fastest rising boxing promotion with the help of his brother John Ray and partner Dexter Tan. 2015 is yet to start but the itinerary of Manangquil is already quite loaded. Suffice it to say, the future is bright for Sanman Promotions and their fighters. Behind every boxer's success is his trainer. In the case of Donnie Nietes who competed in the most significant fight in Philippine boxing this year, he had Edmundo Villamor working silently outside the limelight. The brother of retired world title challenger Edito Villamor was tasked to prepare Nietes to be in the best shape possible, devise a gameplan, and work the corner come fight night. Villamor was the person shouting instructions to Nietes when the latter showcased his most dominant and impressive career victory against Moises Fuentes this past May — a win that made Nietes the lineal champion in the light flyweight division. Six months later, Nietes halted Carlos Velarde of Mexico in seven rounds. The win was extra sweet not only because Nietes successfully defended his title, but he's also bound to rewrite Philippine boxing history as he's about to surpass Gabriel "Flash" Elorde's record of being the longest reigning Pinoy world champion come January.